To display documents in a list, click the List button at right. To display documents as a grid of thumbnail previews, click the Grid button at right. To control the size of the thumbnail previews, drag the slider in the lower-right corner. To see more documents but less information about them, uncheck Show Details in the lower-left corner. Whether documents are displayed as a list or grid, you can choose an option from the Sort By menu to control the order: Name, Relevant Date, Date Added, Date Created. 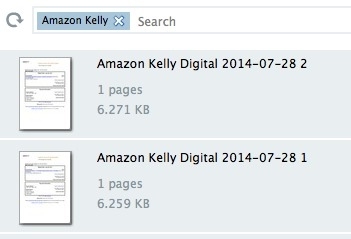 You might, for example, choose Date Added to find a recently uploaded document. You can also sort names/dates in an ascending or descending manner. 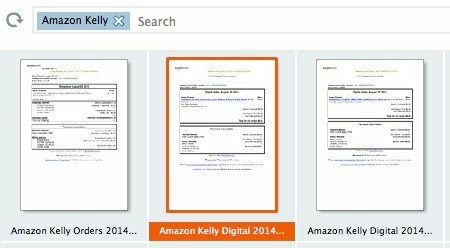 To search for and display a subset of documents in the window, use the search bar above the documents. You can use any combination of a Cabinet or Account along with the Tags, Text, and Dates features as search criteria. Whatever options you specify—for example, all the documents in the Cars cabinet with the Maintenance tag containing the words “oil”—will display. For more information about searching for documents, see "Searching for Documents."